We are so thrilled to once again team up with our junkin' gal pal, Sheryl Crow for a worthy cause. A few months back Sheryl ran across three old cutter quilts from her collection and thought they may be used in a more creative way than just stacked in a pile. We suggested having the quilts transformed into something entirely different such as an art form or a functioning piece in some way. Then auction them off at the June Pop-up Fair and donate the proceeds to Sheryl’s charity of choice. Sheryl loved the idea and so the Sheryl Crow Repurposed Quilts for Charity Project was underway! To find the perfect artist to best represent the project we ran a contest on social media and were so surprised to receive over 300 submissions! It was a very hard decision to narrow it down to 3. There are so many creatives out there! We recently talked with the artists that we selected to get to know them better and see what they envision for the quilts – introducing: Darrell Ezekiel of Scraps of Memory, Laura Locke of Turning Leaf Crafts, and Robelyn Bray of redneck chic. I can’t tell you how anxious I am to see the final transformations. 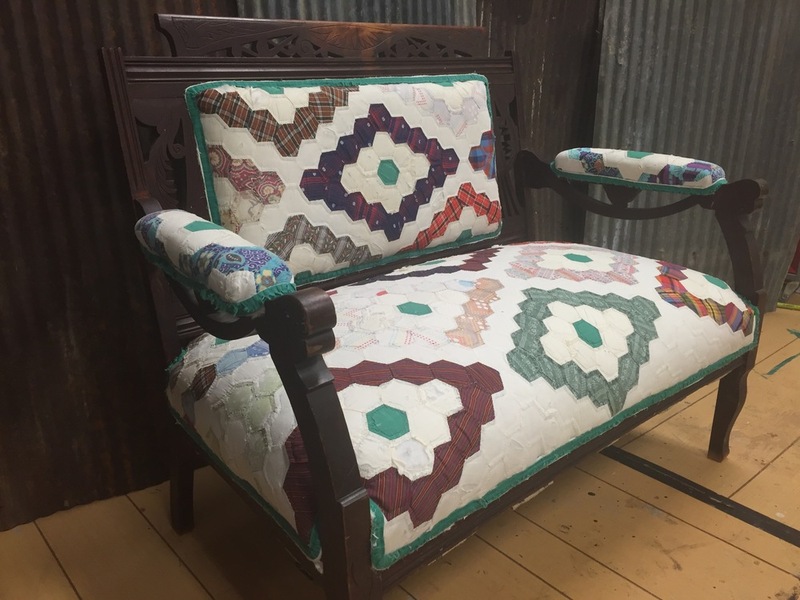 Laura Locke of Turning Leaf Crafts repurposed a vintage quilt into a unique covering for an antique settee. The quilt donated by musician Sheryl Crow will be auction off at the June City Farmhouse Pop-up Fair. The proceeds from the auction will benefit Sheryl's charity - the Syrian Refugees. Robelyn Bray of red.neck Chic is creating a collection of bags from Sheryl's cutter quilt. Here her work in progress shows Robelyn combining the old tattered quilt with vintage leather for an updated look. Q: WHAT MADE YOU DECIDE TO ENTER THE CONTEST? Darrell: I follow City Farmhouse and am a big antique fan. As an artist who has been using vintage quilts in my work for years, this was a perfect fit for me. Laura: I’ve known Kim and David for a long time so when I heard about this I thought it’d be a great match since we do a lot of upholstery. Robelyn: I saw it on Kim’s Instagram -- I’ve known that crazy nut-ball for years and love to support her! Q: WHAT EXPERIENCE DO YOU HAVE WITH QUILT REPURPOSING? Darrell: About 10 years ago, I moved home to be with my mother after she was diagnosed with Alzheimer's Disease. After looking through her closets, I found quilts stacked from floor to ceiling that had belonged to my mother, grandmother, great grandmother and so-forth. Many were “make-do” pieces with an aged patina that had been sewn together but I still saw the beauty to each one. I couldn’t bear to toss them so I decided to give the quilts new life by repurposing them into pieces of wall art -- and I’ve been doing it ever since. Laura: My husband and I have a business called Turning Leaf Crafts where our business model is based on refurbishing and repurposing. I love using cutter quilts for upholstery because they have a little wear and tear, which makes it easier for me to cut them up to fit each piece. I like that there’s a history behind each one and they’ve already been loved by somebody else. Robelyn: I make handbags out of recycled items like shirts, pants, skirts, quilts, etc. for my business Redneck Chic, and quilts are especially fun to work with because they stir up memories. When most people see a quilt they can relate because they’ve had experiences that usually make them think of their grandmother or their mother -- they all have a story to tell. Q: WHAT WILL YOU CREATE FOR THE PROJECT? Darrell: Definitely a piece of wall art, but the jury is still out on what the imagery will be. You can expect to see lots of dimensional layering though, like many of the pieces I create for my business, Scraps of Memory. Laura: I’m going to reupholster an antique settee -- the piece has intricate details and a great patina on the wood so I’m excited to see it paired with Sheryl’s quilt. Robelyn: I’m creating an entire bag collection including an overnighter, a tote, a purse and three cosmetic bags. The holes in the quilts will be patched with random pieces and colors of leather to modernize the look of them. Those who want a first look should attend the Preview Party that will kick off the Fair on Friday, June 17 from 4 p.m. to 8 p.m., where ticket holders will get to sip ‘n shop the show while listening to a live performance from the Jordan Carter Band. Complimentary wine, beer and snacks will be served. Get tickets to the preview party HERE.